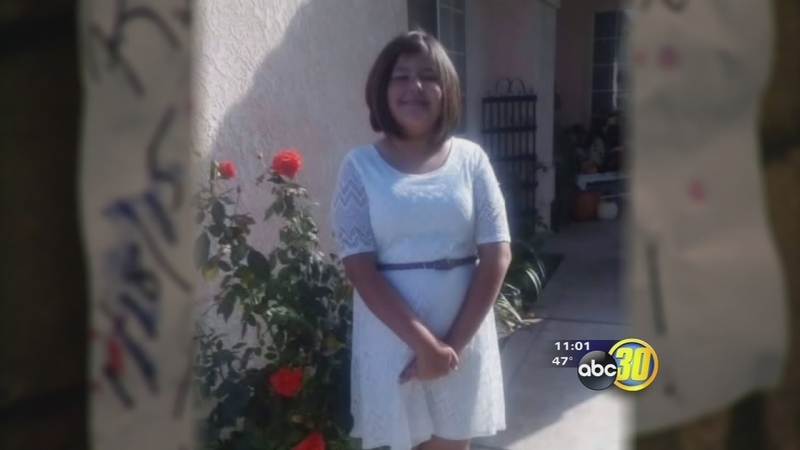 Detectives are on the hunt for the gunmen who shot and killed a 9-year-old Fresno girl. FRESNO, Calif. (KFSN) -- Detectives are on the hunt for the gunmen who shot and killed a 9-year-old Fresno girl. Family members remember Janessa Ramirez as a young girl with a kind heart and a strong faith in God. Police say there was a shootout Sunday night, likely between rival gangs, that sent the stray bullet into Janessa's path. Right now detectives are going over surveillance video from the strip mall at Clinton and Marks. They're hoping it will give them a lead to find the people responsible for the killing. As her family and friends remember her, they're praying for justice. "The color out of her face went like quickly," said Joann DeLeon, a family friend. "Her lips turned blue." Students at Fresno's Steinbeck Elementary School are back in class following the sudden death of a 9-year-old classmate killed in a drive-by shooting. DeLeon witnessed the tragedy. She's a relative who ran into Janessa and her mother Sunday night. They were catching up outside the laundromat when they heard gunshots. "It hit Janessa," DeLeon said. "She was standing right here and it kinda hit her pretty hard. It was like uhh. She bounced back." DeLeon says before Janessa appeared to go into shock she said her stomach burned and her back hurt. "She woke up one more time, for a quick second looking at her mom, her mom goes 'you're going to be okay. I love you, baby,' DeLeon said. "And she goes 'I love you mom.' that was it. Her breath got shallow, more and more shallow by the time she got to the ambulance." Investigators scoured the area for evidence. Detectives say the bullet that killed her was fired from about 300 yards away when two groups started shooting at each other. Detectives went door to door at a nearby apartment complex Monday. At the family's church in Central Fresno several dozen relatives and friends gathered to pray and remember Janessa. "I just hope whoever took her... they have the courage to turn themselves in," said Nancy Alejandrez. "She was still single digit age, 9-years-old," said Janessa's great uncle George Gonzales. Their pastor says Janessa loved Christ and was always showing her family and the church how much she loved them. He and the church hold nothing against the shooters. "What I do is pray for them because they don't know the status of their souls, how depraved they are, because they're walking in the wrong path," said Pastor Douglas Knox, Jr. There is a $5,000 reward being offered to help find the gunmen. Police are even urging relatives or friends to turn them in. Grief counselors will be on the campus of Steinbeck Elementary Tuesday, where Janessa was a student, to help her friends and teachers cope.